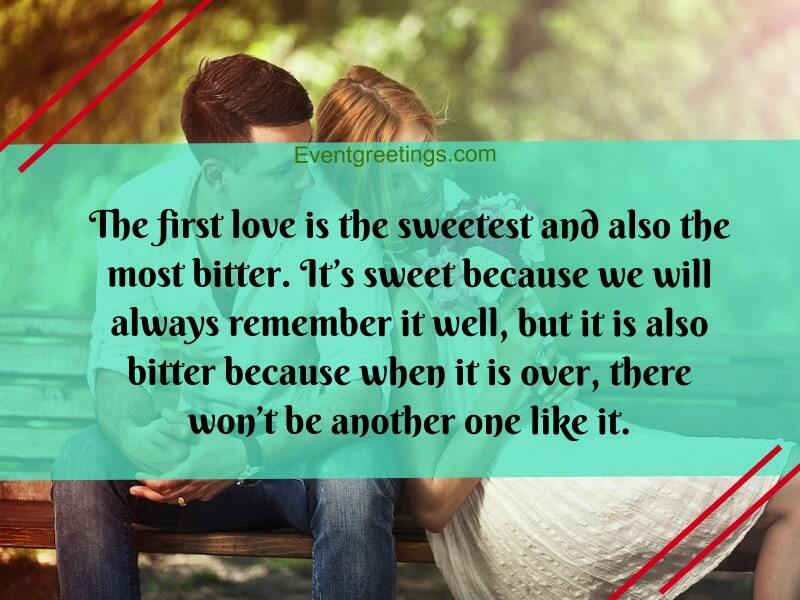 The first love is the sweetest and also the most bitter. It’s sweet because we will always remember it well, but it is also bitter because when it is over, there won’t be another one like it. You were my first love, and you still are the only one for me. I still think of you in the silence of the night and when your favorite song plays in the cafe. How is it that you are everywhere? First love is never easy. There are always unmet expectations, inexperience when it comes to dealing with each other’s issues. If I get another chance to be with you, I will never make the wrong moves again. There’s just something about our first love. Even years later, when you are happily married and in a blissful marriage, you still think of them once in a while and you can’t help but to wonder how they are doing. Our first love was short and sweet. We were both each other’s first, and we had no idea if anything we were upset about was normal or not. It’s sad that we broke off that way, but perhaps it was for the best. The only regret about our first love was not being able to say or do anything to hold on to it longer. But we were young; so young and innocent that we didn’t know better. You were my first love, and you knew that. We didn’t take it anywhere further, but you still hold a special place in my heart. You will always be my first love. Sometimes when I think of you, I wonder about what could have been. Perhaps if we have met only 5 years later, when we are both wiser, things could have worked out. How is it that we have our first loves early in our teenage years, yet the memories can still follow us around for the years to come? It even feels exceptionally painful sometimes, and I don’t know why. In a way, first love is like a mystery bag that you purchase online. You’re excited to get it, but you can never truly fathom just what is awaiting you once you get it. I didn’t believe in love at first sight until I saw you. I swear I am not a shallow person, but you managed to make me feel like you are the only one for me with just a single gaze! My mom probably lied when she told me that angels aren’t real. When you walked into the cafe that day, I could have sworn that angels to exist. It was most definitely love at first sight. I don’t believe in love at first sight. It’s really just symptoms of fast heartbeat, blood rush to the face and nervous thoughts when I see you… Okay, fine, it was love at first sight. I don’t want to sound shallow; I swear it wasn’t your looks or anything. It’s just that I saw the way you were doing something so simple and I think you were my love at first sight. There are many ways that couples can fall in love. Maybe they got along well, maybe a friend introduced them, or maybe they are just like me – with a love at first sight for an angel on earth. Every time someone asks me about how we got together, I just tell them that it happened to be love at first sight for both of us. It’s a weird tale to tell, but we know that it’s true. Love at first sight isn’t easy to come by. It takes a certain type of chemistry and interpersonal bond to be able to tell someone, “Hey, I think I’m in love” with just a glance. Love at first sight did not exist for me until I met you on that fateful day. Ever since then, things have become completely smooth for us and I will not want it any other way. I think love at a first sight is a delicate issue. Some belief in it, but many others do not. Whatever it is that they believe it is not my concern because it was love at first sight that got us together. Love at first sight is amazing. You don’t know anything about a person, yet one look at all you can think of is, “Wow. I’m absolutely in love.” How did that even happen? Most of us remember our first love as someone perfect, someone who can never be compared with anyone else. Such is the importance of the first love that anyone who precedes it can never compare. Everyone knows that first loves never last, but just look at how everyone jumps into it just the same, never fearing for what might come. First love shows a great deal of courage and true, unhidden love. It shows just how brave a person is to have their first budding romance when they never had that experience before. Most people are scared of the unknown, but the experience of first love is always an exception. It’s called falling in love for a reason – people just fall into their first romance with no thoughts or reasons. First love isn’t something particularly simple, but it is also the most innocent romance that a person can have in their entire lifetime. Anyone who has fallen in love for the first time knows exactly what this is all about.